NIA CHARLESTOWN NEVIS (January 19, 2015) — Minister responsible for the Seniors Division in the Ministry of Social Development Hon. 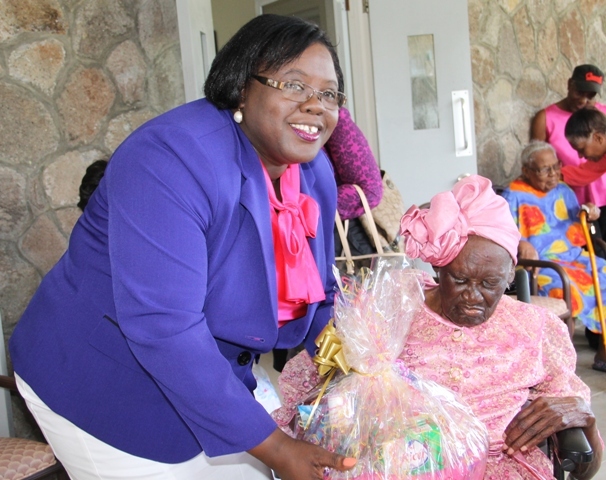 Hazel Brandy-Williams, wished the oldest female centenarians on Nevis well, as she showered birthday wishes on Celian “Martin” Powell at her 103rd birthday celebration on January 19, 2015. The event was hosted by her family at the Flamboyant Nursing Home where she resides. During brief remarks at the celebration, Mrs. Brandy-Williams told Ms. Powell that she should continue to be cheerful. “So Martin, on behalf of all of us, we would like to say congratulations on reaching your 103rd birthday and may you continue to live in the solace of God. May you continue to bring that pleasure to us as the matriarch of the Powell family. Once again congratulations,” she said. 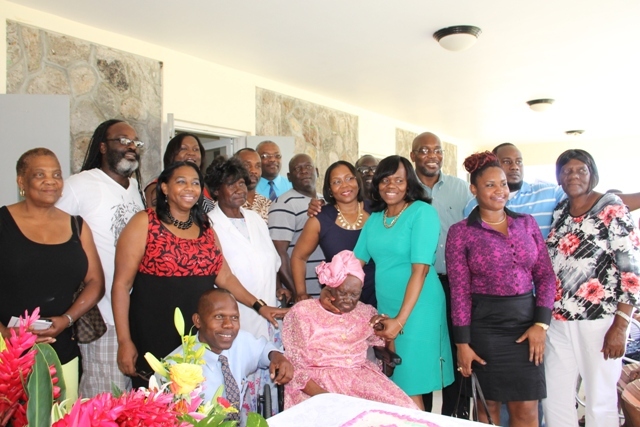 The Minister who is also a friend of Ms. Powell and her family, said the birthday girl has lived a very accomplished life which was evident in the success of those she had raised. 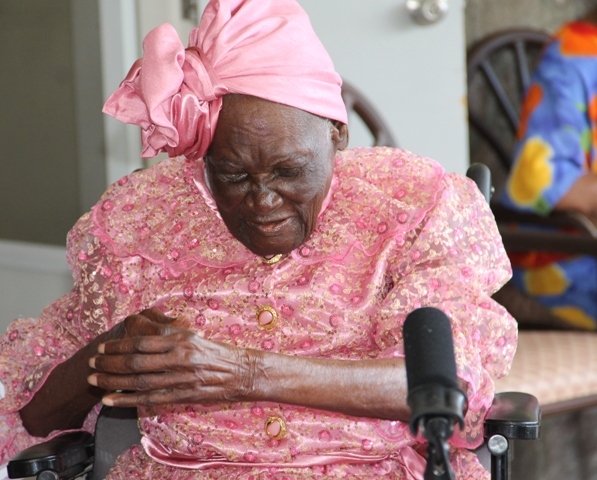 She said 103 was a significant milestone since many were not able to live that long, an achievement that came through the grace of God and the care and attention of her family. Mrs. Brandy-Williams described the achievement as commendable because Ms. Powell had been able to live through four generations of her family. At the end of her remarks, the Minister presented a gift basket to Ms. Powell on behalf of the Ministry of Social Development. In response to the birthday wishes bestowed on her by those who attended the birthday celebration, Ms. Powell thanked God and all those who joined in making the occasion a momentous one. 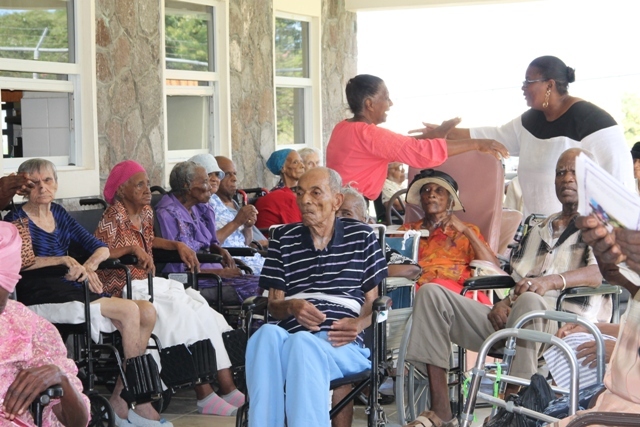 Meantime, in remarks Powell’s first grandchild Kathleen Powell-Rawlins, thanked the Ministry of Social Development and the management and staff of the Flamboyant Nursing Home for the care they continued to give to Ms. Powell and others who reside there. “The staff works tirelessly to make everyone happy, keep them comfortable and believe me, when you have family in the nursing home you sleep a lot easier at night, knowing you have staff who are dedicated, really, really dedicated and go beyond, to make sure that the patients or the other members of the nursing home are happy, are relaxed and are well taken care of. We sleep a lot better at night knowing that Mama is taken care of by the staff,” she said. Other remarks came from granddaughters Erma Powell-Skelton who chaired the event, Claudeth Ishmael who did an impersonation of Ms. Celian Powell and Mervette Powell delivered the Vote of Thanks. Her cousin Pastor Theophilus Kelly said prayers and Mr. Herman Liburd delivered remarks on behalf of the Hon. Joseph Parry. Among those present at the birthday celebration were Assistant Secretary in the Ministry of Social Development Michelle Liburd, Deputy Director in the Social Services Department Joyce Moven, Coordinator in the Seniors Citizens Division Garcia Hendrickson and Powell’s grandson Hon. Carlisle Powell.